Some actions can be performed on multiple pages. Such actions are called group operations. Group operations are performed on marked pages only. To select a page, check its checkbox in the top-left corner on the page tile in the page list. Alternatively, press the Insert key. If you need to mark all pages in the project, use the Ctrl+A hotkey. If you have not marked any pages, the operation will be performed on the current page only. Restore the original image: Each marked page will be restored to its original state. That is, the changes will be rolled back. 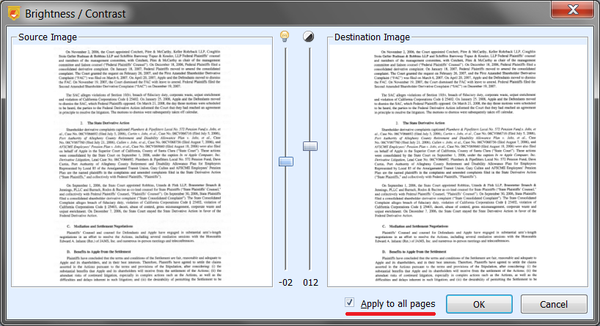 Auto-cropping: Each marked page will be auto-cropped. Split the book spread into two pages: Each marked page will be considered to be a pair of facing pages, and will be split into two separate pages. Auto-sort by page number: The auto-sort operation will be applied to all the marked pages (or to all the pages, if you didn't mark any of them). For more details about auto-sorting, read the Composition section. Rotation (turn left, turn right, flip): Each marked page will be rotated by the specified angle. Remove: All marked pages will be removed from the project. All export operations (save to PDF, DjVu, or a folder): Only the marked pages will be saved. The only exclusion is the print operation; all pages will be printed. 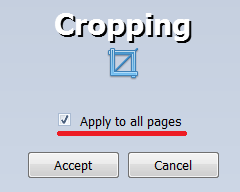 Manual cropping: You can select a cropping area, and then apply it to all the pages in the project by checking the Apply to all pages checkbox. Manual brightness/contrast adjustment – You can set up brightness/contrast adjustment parameters for one page, and then apply them to all the pages in the project by checking the Apply to all pages checkbox.